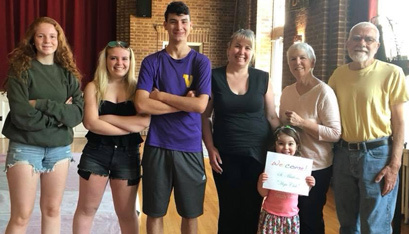 JOY GALARNEAU (center, in black) and volunteers from St. Matthew’s in Voorheesville pack lunches for people in need over the summer through the ecumenical Capital Area Council of Churches. Since becoming pastoral associate for faith development at St. Matthew’s parish in Voor­heesville, Joy Galarneau has found more than a career. “What I do at St. Matthew’s is 100 percent a vocation for me,” she told The Evangelist. Dr. Galarneau has always considered herself to have three major vocations: being a mother, being a wife and working at St. Matthew’s parish. She has become a vital member of the parish staff, according to her pastor, Rev. Christopher DeGiovine. “She is a blessing to me and to St. Matthew’s because of her great wisdom, compassion and complete dedication to helping people grow in the faith,” Father Degiovine said. Dr. Galarneau, a native of the Albany Diocese, oversees a number of parish faith formation initiatives, including the popular Generations of Faith (GoF) program. GoF is an intergenerational catechetical program that was started by the former directors of religious education, Ellie Dorn and Suzanna Schultz. The program meets once a month and focuses each year around a central theme, such as “justice and moral living.” It offers breakout sessions for multiple age groups, ranging from kindergartners to adults, so children and their families can learn and grow together. The pastoral associate said she is “a proud and grateful” alumnus of Catholic schools, having attended St. Paul the Assumption School in Mechanicville and Catholic Central High in Troy. She never forgot those words, and went on to earn her undergraduate degree in religious studies from The College of Saint Rose in Albany. Originally, Dr. Galarneau was pursuing a double major with social work, but she found herself questioning why there was so much suffering in the world. Her advisor at Saint Rose, David McCarthy, encouraged her to go to graduate school and explore her questions: “He was amazing. He really me on track to becoming a theologian,” she said. Dr. Galarneau earned a master’s degree from the University of Notre Dame and a doctorate from Fordham University, both in theology. While completing her doctoral work, she began working as a program assistant at MIT, which was quite a commute. “Sometimes I flew; sometimes I took the train,” she recalled. In 2011, Dr. Galarneau left a position at Boston College as assistant director of graduate student life to take a job at Siena College in Loudonville. Her father had been diagnosed with cancer, but moving back to the Diocese had always been on her mind regardless. Shortly after her move, she met her husband, John, and said she “just knew” he was the one. Making a leap from higher education administration to parish life meant some adjustments, but Dr. Galarneau said that once her family made God the priority, everything else fell into place. “My daughter has literally been raised in our church — literally, in a playpen in my office or in a high chair in the kitchen,” she said. Her background in theology has been a big benefit at St. Matthew’s, and the Galarneau family attends the GoF program together.